Thread veins or Spider veins, medically known as Telanglectasis. They are small visible blood vessels on the skin. Some veins appear to be thin and red whilst others can develop larger in diameter and become purple. They usually are harmless and come with minimal symptoms. They may develop anywhere on the body mainly on the face or the lower body such as legs. They can be treated. Removal of facial & bodily blood vascular lesions without surgery is possible. Within 6-8 sessions of IPL treatment, you will see visible relieve to the veins. Our Photo Rejuvenation procedure is designed to produce younger and healthier looking skin. As we age, we begin to see small but visible signs of sun damage appearing in our complexion. This may include freckles, rosacea, wrinkles, broken capillaries, dark spots, blotchy skin color, redness of the face and neck, enlarged pore size and sun damage. 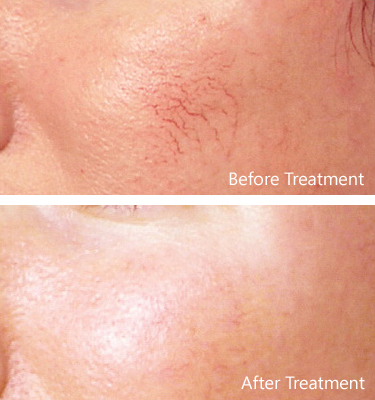 This treatment using IPL (Intense Pulse Light) is the only treatment that can treat vascular redness, pigmented brown spots, sun damage and the collagen structure all at the same time. With the use of our state-of-the-art technology, dramatic improvements can now be accomplished with little or no “downtime” and with minimal discomfort.